The trend of outsourcing in-house IT-services to professionally managed co-location data centers requires new ways of electronic access control. Not every customer needs their own cage or a complete suite to house their IT hardware; a few cabinets are sufficient in many cases. This may lead to the situation that different customers are housing their equipment in the same row of cabinets in the data center. Therefore, access control to each individual cabinet plays an important role here. For a secure access control to cabinets in data centers with high visitor frequency, a key based solution is not an option. Handling, especially in the event of a key loss, is difficult and costly. Electronic locking solutions with event log, operated remotely via network or locally via keypad or transponder, offers easy access for the customer to their cabinets while the data center manager has a complete audit trail stating WHO has opened WHAT and WHEN. Different access control systems with electromechanical locks for server cabinets are available on the market to suit these needs. In spite of the unquestionable advantages, people back away from the idea of electronic access control when beginning to engage with the subject at a deeper level. 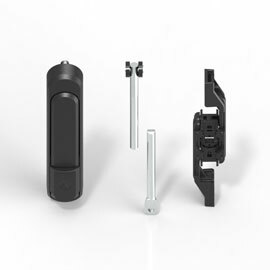 Opening an AGENT E swing handle is via micro transmitter ("TAG“) which initiates the opening process on authorised handles. The light beam of the TAG is directed to the photo cell in the swing handle. The light is multi-coded, each TAG has an individual code. 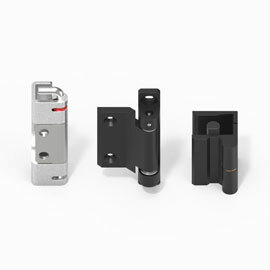 Scalable for the different needs for security, the system is available in three versions. Version "Basic" allows authorisation of TAGS via special micro transmitter called "MASTER". 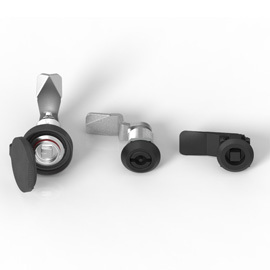 Advantage versus a conventional locking system is that invalid TAGS can be removed without replacing the lock. Version “Professional” offers an increased level of comfort. Authorisations of TAGs, locking plans and time profiles can be entered via software and integrated USB interface. The built-in event memory can be read out and evaluated. The operator can easily check who has opened a lock and when it has been closed again. An additional door contact can be connected to monitor the door status. Version "Superior" is the right choice in larger applications. All activities can be managed remotely; communication to the swing handles is via radio waves. Configuration, data read out and opening of AGENT E handles is radio controlled. Alarms are available as relay contacts or SNMP Traps. 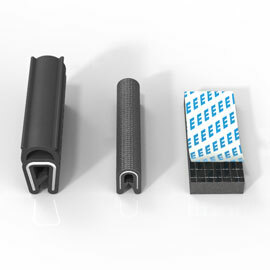 If required, this version also allows handle opening with keypads or transponder systems. All versions of AGENT E are particularly energy-efficient; battery life time is approximately 3 years or at least 15000 opening cycles. The problem of an emergency power supply which is missing on many electronic locking systems has been solved perfectly. A running laptop computer or a mobile phone charger according to the new standard is connected to the USB port in the handle to power up a unit with depleted batteries. Then an authorized TAG will open the lock as usual, granting access to the cabinet and to the battery box under the handle.